James Balog is a nature photographer who uses time lapse photography to capture visual evidence of climate change. In CHASING ICE, Filmmaker Jeff Orlowski chronicles the efforts of Balog and his team, showing how even the very real risk of lasting personal injury isn't enough to dissuade Balog from his efforts. Considering how many people, especially in the United States, still believe (or pretend to believe) there's a legitimate controversy in the scientific community regarding climate change, one has to wonder if Balog's efforts are really worth it. As he sums it up near the end of the film, though, at least this way he can tell his daughters he did everything he could. At any rate, both Balog's time lapse images and the story behind how he gets them provide ample interest for a documentary feature. If nothing else, the footage of glaciers collapsing into the sea is amazing. But the human element is fascinating as well, and one has to admire Balog's efforts to show in a clear, straight forward manner that anyone can understand that this global warming thing is real. Having a laudable message is not enough in and of itself to make for a good film. Take AN INCONVENIENT TRUTH, for example. I essentially agree with what it had to say, but it was a mediocre film at best; a crushing bore of a PowerPoint presentation that preached mainly to the converted. 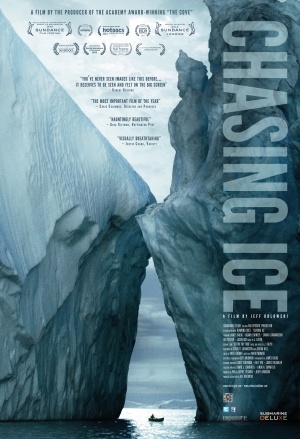 CHASING ICE may not be as substantive of a film, but it uses the strengths of the visual medium much better, and because of that it might actually reach some of the more rational climate change skeptics. As we see in the film itself, Balog's work has convinced at least one former oil company employee to switch teams. Here's hoping this movie makes a few more converts, because ultimately this is a far more important issue than any “fiscal cliff”. 3 out of 4 stars.